Wonderful! I love to look into your world! Thank You for sharing it with us!!!!!!! Great Sketches! well well well, isnt that interesting, the day i buy a rtw ticket including europe, you put this in. perhaps when i get to italy i should buy some. thanks for the unintentional heads up! Crikey Miss J. I have just seen that AMAZING shiny see-through paper that you have drawn in the licorice tin - amazing (did I mention that? )Just amazing. Your 'talents' know no bounds. Onwards and upwards! I confess - I didn't click on the picture and take a closer look... Having sat on the naughty chair for ten minutes I have to agree with Tim - the transparent paper in the tin is awesome! wow! yes, that transparent paper is amazing! i can never get over the detail in your drawings! out of interest, how long does one take you? and the piece of paper that says Saila on it.. wow, it looks so real!! 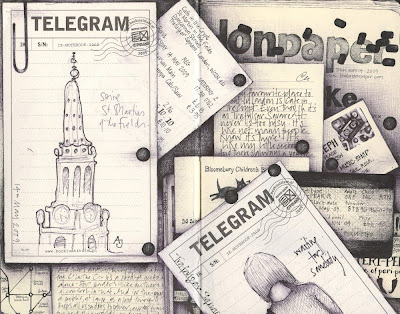 Goodness, how did you achieve the identical paper of the two telegrams in the first sketch? Wow! phenomenal, phenomenal, those telegrams, that's incredible, wow another blow-us-all-away work! flippin eck. Wicked. Nose to the screen goodness. Fab, Andrea. I want to repeat what Ryan wrote. I ditto Pete's "flippin eck." And triple the "Wicked!" Good Lord, it is always a pleasure seeing more of your work! 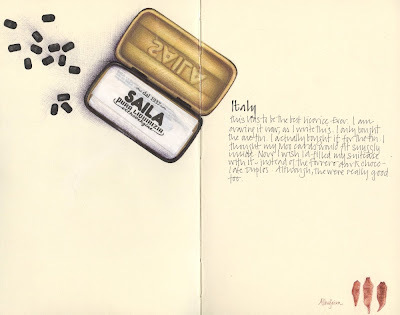 I love what you're doing with this moleskine! yes please more. i could never get tired of your drawings. i love them. the detail is amazing! Andrea, Andrea, Andrea. Quit putting your work down. We wouldn't return to your blog if we (speaking for the whole internet world out there) didn't find your art fascinating. I have NEVER been disappointed with what you've shared with us—even when it included an illustration of Mr. Obama. Why isn't there a book of these travel pages? They tell a story in the most beautiful, quirky way. Surely someone would publish the story of your (or a fictional characters) travels? It would be a great way of telling some kind of mystery in ephemera. Just so you know, I want to be just like you. Hope that doesn't make me stalkerish. I think your noticeboard style drawings are my favourites - so many things to look through and study. This is wonderful! I also love the little sketch of the spire. And the licorice tine is brilliant - did you stick a real receipt onto the page, inside the tin? It pops out so much - really brilliant! I've been offline for a few dyas. Some technical hitch, and it's been an absolute KILLER! I can't believe how much it is possible to miss the internet, and, of course, all you lovely people. Thank you all. I love ya! I've just got to say...and I know I've already left one comment here...but that transparent paper inside the tin is astonishing. So believable it is totally unbelievable.